Puzant OzbagPuzant Ozbag’s Tesla Model X, post-crash. Oops. 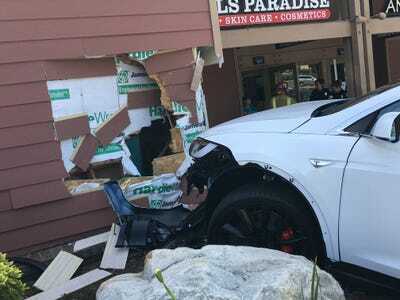 On Saturday, Tesla owner Puzant Ozbag made a scary claim: his Model X vehicle had suddenly accelerated into a wall by itself while parking — injuring his wife (who was driving) and narrowly missing bystanders. Puzant OzbagThe damage done to the building by the crash. The fear was that the vehicle had somehow activated “autopilot” — the self-driving mode in Tesla vehicles. This would have serious implications for the safety of the company’s electric vehicles. But Tesla has now reviewed the vehicle’s logs, and says Autopilot or cruise control was never activated, and that the accelerator was pushed. That indicates a more prosaic reason for the crash: The driver accidentally pressed down on the accelerator pedal. 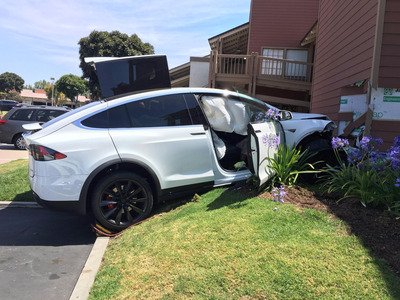 We analysed the vehicle logs which confirm that this Model X was operating correctly under manual control and was never in Autopilot or cruise control at the time of the incident or in the minutes before. Data shows that the vehicle was travelling at 6 mph when the accelerator pedal was abruptly increased to 100%. Consistent with the driver’s actions, the vehicle applied torque and accelerated as instructed. Safety is the top priority at Tesla and we engineer and build our cars with this foremost in mind. We are pleased that the driver is OK and ask our customers to exercise safe behaviour when using our vehicles. My wife is a 45-year-old woman with a great driving record. Not and incapacitated driver. She has been going to that center for over 20 years and parking in the same stalls hundreds of times. She knows the difference between brake and accelerator pedal. I am waiting to hear from Tesla whether the accelerator pedal can be depressed by the car electronically similar to gas-powered cars’ pedal being depressed on their own while in cruise control. If a fault in Tesla vehicles means that they can suddenly slip into autopilot and the logs don’t even register it, then it has pretty worrying safety implications. But right now, there’s no direct evidence for that, and all the signs point to a much simpler explanation: Driver error.